Attend the upcoming Facilities Planning meeting on February 13th at 7:00pm at the VSB Boardroom, 1580 West Broadway. Sign our PETITION. Forward to your friends and family to sign. Write a letter to your MLA, copy it to the trustees and to the VSB. Thank you to those of you who attended the VSB board meeting on Jan 28th. To our shock and disbelief, the Vancouver School Board trustees did not make a motion on our behalf to pause and allow for proper consultation to take place in the designing of the new Eric Hamber. They also did not motion to advocate on our behalf to the Ministry of Education to increase the footprint and allocated budget to get Hamber built right. The next Facilities Planning Meeting is on Wednesday, February 13th at 7:00pm at the VSB. There will be other groups, including students, parents making delegations at this meeting about the Hamber seismic project. We need to give them a strong show of support so please make every effort to attend the meeting on the 13th! This Feb. 13th Facilities Planning Committee meeting will also be the only public forum to hear the results of the VSB survey that we were asked to complete. We are asking for as many people as possible to please attend this meeting! (Please note that at last VSB board meeting, we learned that instead of a summary of your written feedback, the trustees will now be given copies of ALL the surveys to review and consider). Some more amazing letters have been written. Please read the letters from two Hamber teachers, a Hamber counsellor, a Hamber grad, class of ‘72, and one from a grade 9 student! Write a letter of your own to the Minister of Education, your local MLA, and trustees. On Wednesday, January 23rd, your Hamber PAC and the Hamber Alumni Association made a delegation to the Vancouver School Board Facilities Planning Committee. The presentation can be found HERE. At that meeting we asked the VSB Trustees to pause and allow for the proper consultation to take place in designing of the new Eric Hamber. We also asked the Trustees to do what they were elected to do - make a motion to advocate on our behalf to the Ministry of Education to get Hamber built right! Attend two meetings at the VSB offices. The first one is on Monday, January 28th at 7:00pm. This meeting is when the elected VSB Trustees should make our motion. The second meeting is on Wednesday, February 13th at 7:00pm. We need a strong showing of support at these meetings! Sign the PETITION. Forward to your family and friends. Please send us video clips. We’re creating an archive of short (less than 30 seconds) video clips. We may use some of them in a short video. We’re looking for anything that portrays Hamber spirit! Sports, clubs, games, practises, rehearsals, spirit week, performances, competitions, fashion shows, victories, defeats, participation, we love our school...! Please upload your video to our Dropbox. A special thanks to Patti Bacchus for her well written article in the Georgia Straight about the Hamber seismic project. 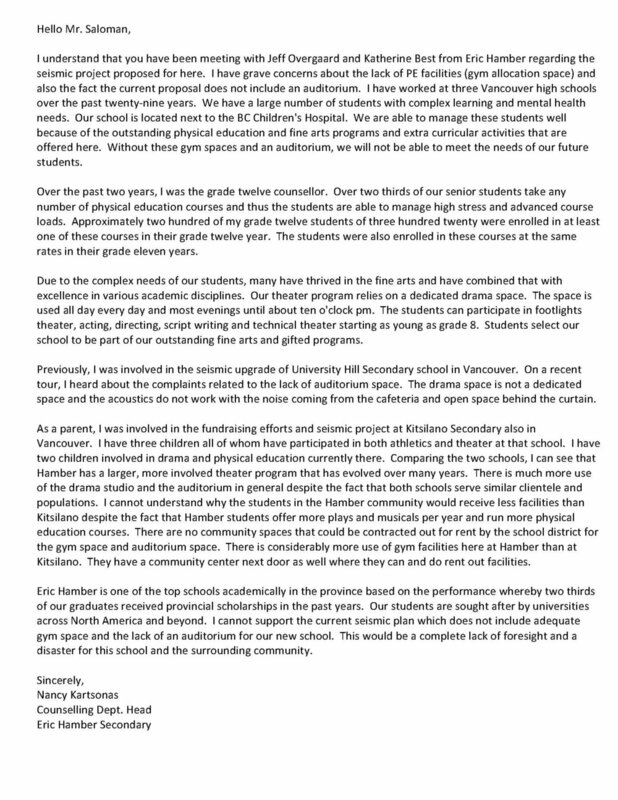 And to Carrie Bercic, a former Hamber PAC chair and a public education advocate, who has also written an excellent letter to the VSB trustees. 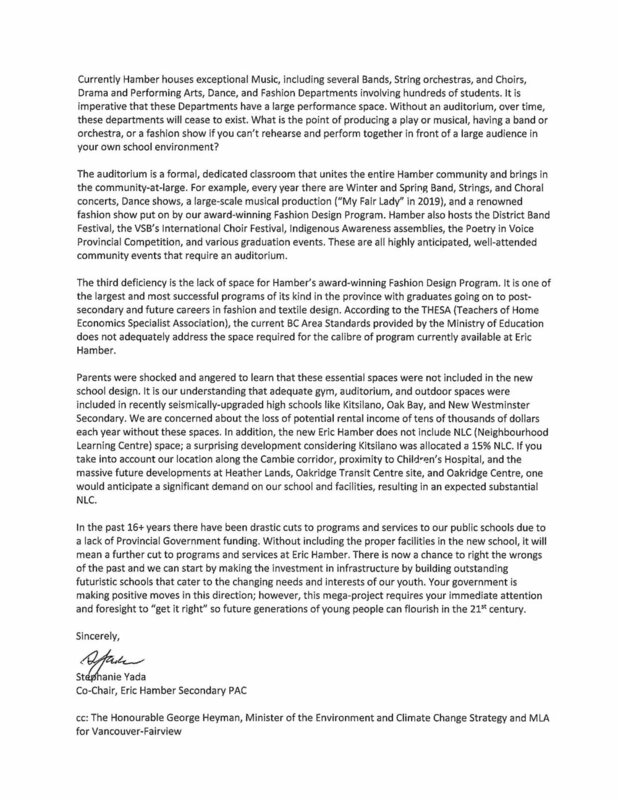 Here is the PAC's letter to the Ministry of Education. If you read these three letters/articles, you will gain a good understanding on what the issues are with Hamber's seismic project. 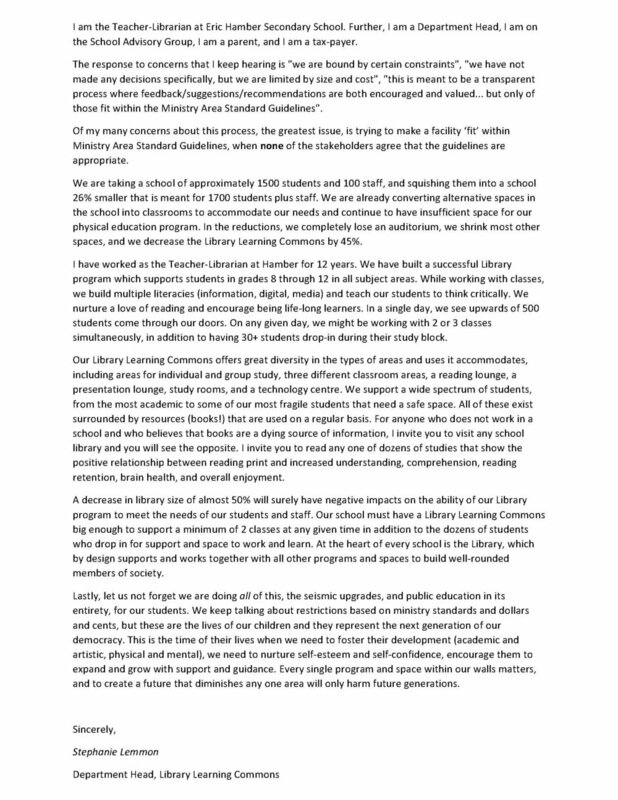 Use these letters and article as a template to write your own letter to the Minister of Education EDUC.Minister@gov.bc.ca and to your local MLA, with copies to the VSB Trustees. ﻿If you missed the Public Info Session on Jan 11th, the display boards can be viewed HERE. The VSB survey is now closed. However you can continue to send your comments to the Ministry of Education EDUC.Minister@gov.bc.ca . As of today, there are nearly to 4,600 signatures on the petition! If you haven't signed it, please click on the link below, sign and forward to your friends and family. The Ministry of Education is providing $79.3 million to fully replace our school. It will be the largest seismic project in Vancouver’s history. The new seismically safe Eric Hamber will be built next to the existing school on the northwest corner of the site. Students will remain in the existing school during construction. The new school will be built to Leadership in Energy and Environmental Design (LEED) gold standards. LEED gold schools are healthy, high-performance learning environments that include sustainable low-toxic materials, natural light, abundant fresh air, energy conservation, and reduced demand on local landfills. Construction was slated to begin in summer 2020, with completion in fall 2022, but that date has been moved up as estimated construction costs continue to grow by 1% every month. Construction will now begin in January 2020, with a targeted completion date in early 2022. From 2022-2032, the existing Eric Hamber will be used as swing space to accommodate future schools undergoing seismic upgrades. After that time, the old structure will be torn down. 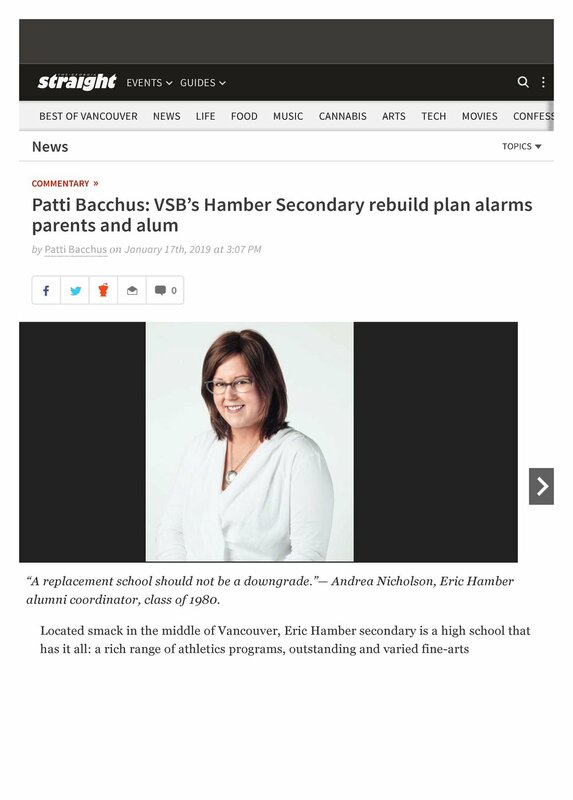 Eric Hamber Secondary’s Seismic Replacement School VSB School Advisory Group consists of Eric Hamber’s Administration, as well as teacher, support staff, VBE, PAC, and student representatives. All Eric Hamber Department Heads have provided input to the Vancouver Project Office (VPO) on the functional requirements and needs of the each of their respective departments. The new school will be built to accommodate 1,700 students, the same capacity of the existing school. The actual physical space will be 26% less than the existing school. The Neighbourhood Learning Centre allocation is 0%, but there will be a child care facility in the new school. The interior design will reflect recent VSB builds like Kitsilano and University Hill Secondary. Floorplans will support 21stcentury learning with flexible spaces, open concepts with multi-purpose spaces, and movable furniture. There will be” huddle spaces” in the halls with half-sized lockers, built-in seating, microwaves and sinks. The current design for the new Eric Hamber does not include an auditorium. The drama studio and fashion program space will both be substantially reduced. The new school may not include a servery. There will be a dance studio and a band room. Storage spaces will be substantially reduced in the new school. There will be very limited storage for musical instruments and sports equipment for example. The allocated gym space in the new school will be reduced by 19% from what it is currently. This reduction does not allow for the current number of PE classes to be scheduled in proper gym facilities. In addition, there will not be a track or a football field on site for at least 10 years while the old school is being used. The field in the northwest corner at 33rd and Willow will be turned into a parking lot. Jules Verne Secondary will continue to use Oak Meadows as their outdoor space. Because the useable onsite outdoor space will be very limited and over-used, other neighbourhood fields and sports facilities may be utilized. The cost to build an auditorium and increased gym space is 6 million dollars. RE: Seismic - Did you know?